"It is with great pleasure that I am writing to you after reading your fascinating Idea Book. My brain is on fire and the wheels are turning. Thank you for the sleepless nights, empowered by creative thoughts and ideas." - Phyllis C., Fine Arts and Communications Studies Educator. Would you like to do what you love and still pay your bills? Barbara believes that everyone should live their dreams and she shows you exactly how to do it in her typical down-to-earth way. Read about the accountant who became a cowboy (without losing any income), the woman who created a high-paying career based entirely on her love of reading books and the artist who was an out-of-work secretary and is now a wildly successful photographer who's been featured on CNN, The New York Times and dozens of other major newspapers. You'll find jobs you probably never heard of and dozens of unexpected ways to realize dreams everyone told you were impossible. There are even ideas in these pages that no one is using yet but might be perfect for you. Forget the conventional wisdom that says you'll need lots of money, fancy credentials, business plans, bank loans or investors. Thousands of people are already doing what they love without any of those things. 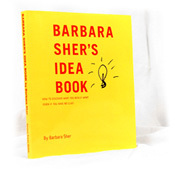 Barbara Sher's Idea Book is designed to give you a completely new viewpoint and to jump start your own creativity. Barbara won't leave you there, however. She has included in the back of the book the precise steps that will turn your ideas into reality. This is a brand new publication, not available in any bookstore. Until how it has been offered only by public television stations as a pledge gift. However, Barbara has had so many requests for the Idea Book from locations where her shows aren't airing that she has made it available here for the first time.